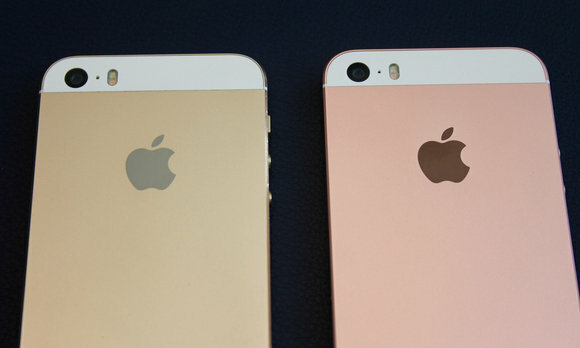 Apple's latest iPhone brings back memories of the iPhone 5s. I remember the first time I held the iPhone SE in my hand: The year was 2012, and it was called the iPhone 5. To be sure, there are a few very subtle design differences between the iPhone 5 and the iPhone SE, announced Monday by Apple. But when you hold the iPhone SE in your hand, as I did after Apple’s media event, you’ll be taken back to the iPhone 5 and iPhone 5s. Apple’s newest iPhone model is not a new take on the classic 4-inch smartphone; it’s an upgrade to Apple’s flagship phone design of three and a half years ago. If you’re curious about the style differences between the iPhone 5s and the phone replacing it in Apple’s product line, I’m here for you: I brought my gold iPhone 5s to Apple so that I could compare the two models directly. The Apple logo on the back of the iPhone SE is a stainless steel cut-out, like the iPhone 6 family; the iPhone 5s Apple logo is a silver screenprint. The chamfered edges on the front and back of the iPhone SE are matte, compared to the shiny chamfers on the iPhone 5s. The Apple logo and the edges are different, but otherwise, it's hard to tell the differences between the iPhone 5s (left) and iPhone SE (right). I admit, it’s been a while since I held a four-inch iPhone model in my hand. I’ve been using the 6 series since day one, and generally loving it, though I had to put on a case because I felt the phone was just too slippery. Gripping the iPhone SE reminded me just how blocky and solid this design is, and in a good way! It fits more comfortably in my hand than the iPhone 6 or 6s, let alone the extra-large Plus models. The trade-off for this, of course, is a much smaller screen. The iPhone SE’s 1136x640-pixel display is a far cry from the 1334x750-pixel display of the iPhone 6 and iPhone 6s. If you’ve gotten used to the iPhone 6 display, it will be hard to even consider moving to the iPhone SE. But if you’ve been holding out for a replacement for your iPhone 5s, your day has come. 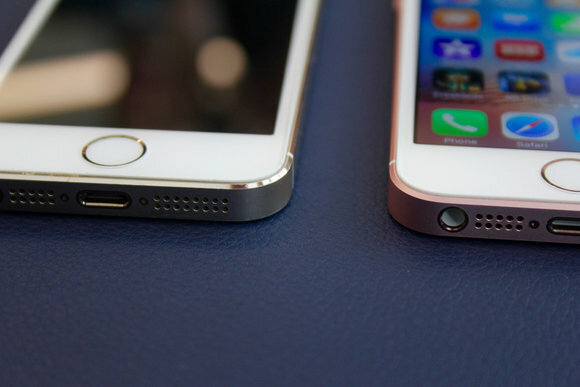 The iPhone 5s (left) has shiny chamfered edges while the iPhone SE's (right) edges are matte. I suspect there’s another class of users who will update to the iPhone SE: People who got an iPhone 6 or 6s because it was the latest and greatest tech, not because of the larger size. While the iPhone SE looks like 2012 or 2013’s vintage on the outside, it’s pure 2015 on the inside. From the A9 processor with M9 coprocessor to the advanced wireless radios and support for Apple Pay, the iPhone SE is a modern iPhone in many ways that the iPhone 5s couldn’t be. The processor advance alone boosts the SE to twice the speed of the 5s. And so far as I could tell based on my viewing of the spec sheet and quizzing of Apple employees, the iPhone SE’s camera is basically the same one found in the iPhone 6s, right down to support for 4K video. But the iPhone SE is not a perfect match for the iPhone 6 and 6s. The display, while still a bright IPS screen, is more in line with the screen on the 5s—it’s got a lower contrast ratio and reduced viewing angle compared to the next-generation screens on the iPhone 6 and 6s. And the Touch ID sensor is unchanged from the 5s, so it’s slower than the new second-generation Touch ID sensor found on the iPhone 6s and 6s Plus. The iPhone SE’s 1.2-megapixel selfie camera is a match with the one found on the iPhone 6, not the upgraded 5-megapixel model found on the iPhone 6s. And there’s no built-in barometer, so forget thinking of using the iPhone SE to track how many sets of stairs you’ve climbed or how many vertical feet of snowboarding you got in over the weekend. The iPhone SE goes on sale March 31, so you can hold one in your hand yourself and decide if you want it. But really, if you or someone you know has an iPhone 5 or 5s, just hold that phone in your hand and imagine what it would be like to have iPhone 6s power in a design from 2012. That, in a nutshell, is the truth about the iPhone SE.